Based on a heartwarming true story of a stray dog who, after being rescued by a railway guard, travels far and wide by jumping on board any train that passes by. He befriends other train driver, guards, and porters, wherever he goes; and always seems to find a warm bed for the night. Despite having adventure in his heart, he still doesn’t miss an opportunity to visit the railway guard who rescued him. 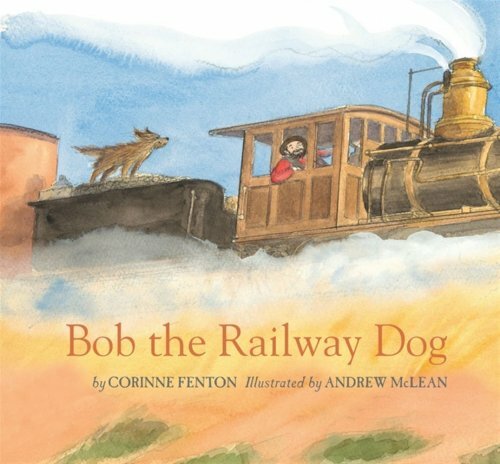 Bob the Railway Dog provides us with a glimpse of the early days of Australia’s railway network. What stood out to me about this book was the beautiful descriptive language that makes you feel like you are there in person, travelling with Bob every step of the way. The author makes clever use of figurative language, with phrases such as “a train crept, hissing and sighing” (onomatopoeia); “faster than a lightning flash” (hyperbole); “shiny new tracks like spiderwebs” (metaphor); ““Spinifex bushes peeped from beside the tracks like woolly headed ghosts” (simile); and “the glow of one lonely beam” (personification). For further speech and language targets in Bob the Railway Dog, see the list below.